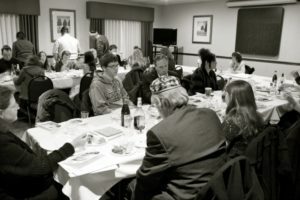 Although Jews have lived in Kearney for decades and have informally gotten together for Passover seders and other events over the years, the Central Nebraska Jewish Community did not formally began meeting until 2004 when some of the Jews in the area wanted a more frequent connection. The Central Nebraska Jewish Community has a relationship with the South Street Temple, and many members of the Central Nebraska Jewish Community are also members of the South Street Temple. Some of children in the Central Nebraska Jewish Community attend the Lincoln Jewish Community School, commuting to Lincoln for Sunday school and participating by video on Wednesdays. The group now holds weekly Friday night meetings at a member’s home. Starting at about 5:00 p.m., children study religious and Hebrew school materials followed by a craft and game time, while the adults study a Judaica topic decided on by the group. Around 7:00 p.m. everyone joins together for candle-lighting, Kiddush, and Motzi followed by a dairy potluck dinner. Additionally, every year the South Street Temple and the Central Nebraska Jewish Community host a joint Shabbat Weekend in Kearney. The Central Nebraska Jewish Community also celebrates all of the major Jewish holidays. On Rosh Hashanah and Yom Kippur, members carpool to Lincoln to attend the South Street Temple for some of the High Holy Day services, and organize lay-led services in Kearney for the other High Holy Day services. The Central Nebraska Jewish Community also gets together for services and activities on Sukkot, Simchat Torah, Hanukkah, Tu B’shevat, Purim, Passover, Israeli Independent Day, and Shavuot. The annual Passover seder is held the first night of Passover at the Country Inn and Suites in Kearney. It is generally attended by 20-25 people. The Central Nebraska Jewish Community is a volunteer organization and freely welcomes all who have an interest in and connection to the Jewish people. Those interested in connecting with the Central Nebraska Jewish Community may contact coordinator Dawn Mollenkopf at mollenkopfdl@unk.edu.